Electric Sailboat . . . On The Cheap ? I'm thinking of powering my Newport 28. I've seen the conversion kits and they're not too costly. Problem I have is I'm cheap and I hate spending more money than I need to. I know that brushless motors use less wattage to run than do brush-type motors. BUT, I also know one of the chief complaints of sailboaters is the gas/fuel that is always left at the end of the year. I also know that many sailboaters . . . in fact most all the sailboaters I know, only buy gas at the beginning of the boating season. Often they're topping off any gas they left from the previous year. 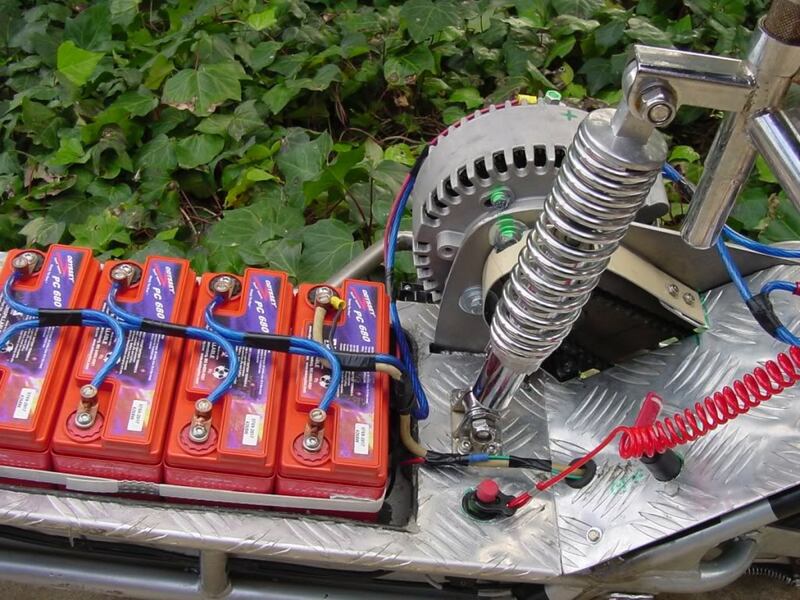 With this in mind, I wonder why brush-type motors are not being used for electrifying boats. I know that there's no sparks in a brushless motor, but seriously, the lack of a sparking brush is not a safety concern. Re: ELECTRIC SAILBOAT . . . on the cheap? My main concern is simplicity(after cheapness). A brush-type motor can be more easily replaced and if the controller goes bad, almost any electronics place will have a reostat(sp), that can get you home. WORSE comes to worse, you can get home with no controller and removing 12 volts from a 24 volt system can be accomplished easily. The brushless unit is nice in every way except simplicity. How do you figure 30Kw peak at $700 as costly? The Lemco line of motors are twice as much for less power. And a rheostat that can handle 300 amps is going to be one honking big rheostat. I'll admit a pulse width modulated DC controller would be easier to find in the field, but that is why we a sailors use FedeX. I'm sorry but the motor is quite costly compared to the brush-type motor I'd expect for a 28' sailboat. Seriously, I never even notice the wattage. 30,000 / 746 = 40.2 hp. If you are thinking you can still pick an Etek motor for $275, those motors are all gone, I have one I'm using and one spare. Bob, Nice set up! Leave it to a boater to put in a kill switch. I was think if you were to build a little cabin/box over the trailer batteries, it could go incognito. I've heard, that for marine use anything above 48 volts(I think), requires much more in the way of regulations. I'd like to keep my voltage down to 36 or even 24. At 24 or 36 volts I can carry a small electric auxillary on the back of the boat and in case of motor problems can wire directly to the auxillary as a backup. I've even thought of going hybrid and leaving my Atomic 4 in the boat, with the option of using an electric motor for in the marina, tight places and such. That would be brushless for sure. If you were building for resale to the general public you are correct, 48 volts would be the max without secondary UL approval. I prefer higher voltage so I can have lower amps for the same amount of work done. The trailer with the (6) flooded 8 volt golf cart batteries was built just for a race that was 50 miles on historic Route 66 in Arizona. The last year I raced against the gasser scooters, they decided to handicap my electric by having an open road race instead of a short course. 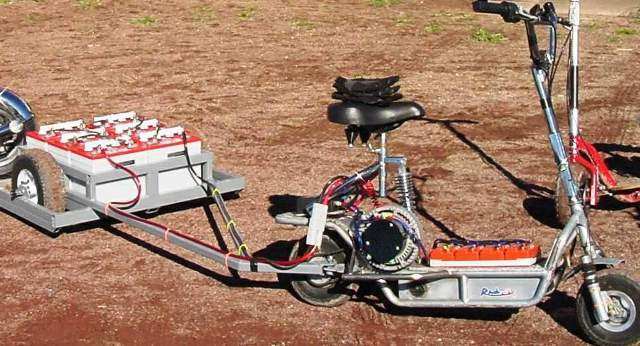 The AGM batteries I use on the scooter are only good for 6 miles, but the battery trailer allows 60 miles. The scooter will out accelerate my Corvette to 40 MPH, and if it was a bronco in the rodeo it would have a perfect record. 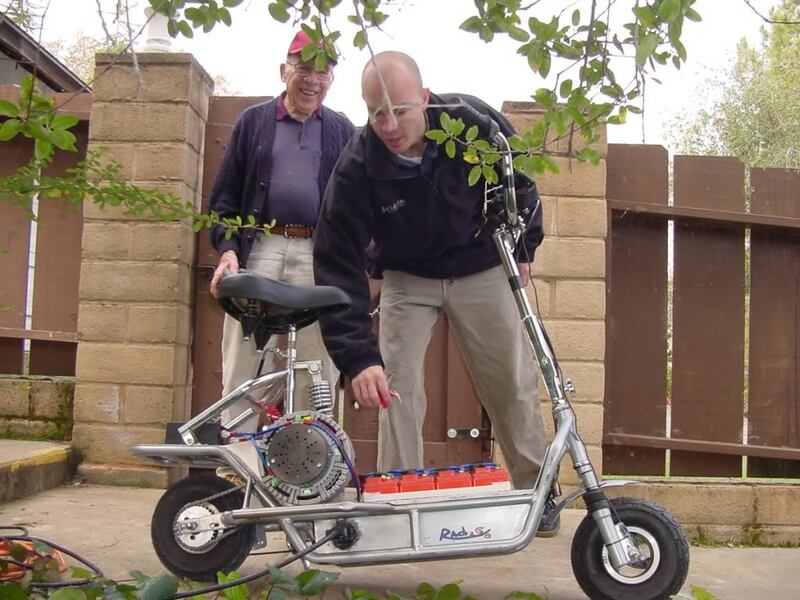 I had in the past allowed 5 friends and family to ride the scooter, and even after a through pre-flight on the fact that the motor has all of its torque available at zero rpm, all 5 wound up on their butts. SURV69 be careful being cheap. I consider myself pretty cheap. But I have learned that somethings you don't go cheap on and it saves more money than it costs. Take a more expensive moter that uses less power. That would mean longer battery life. Do you really want dead batteries when you need them? I have been looking into this subject a lot. What is that thing? do you made it by ot self? Mike is correct about being able to direct connect to a brushed motor should the electronic controller fail. The Etek I use is a brushed PM motor, but for the sake of the shaft coupler, I'm not sure I would direct connect at 48 volt, but might if needed at the 24 volt level. Firstly, my hat is off to you for an absolutely fantastic and thorough blog on going EP in your Nonsuch 30. I didn't plan to stay up late last night, but couldn't put your blog down as they say---read and re-read. That combined with reading just about everything Deckofficer "Bob" has written on EP has me seriously thinking of re-powering my Freedom 32. It's an oddball boat anyway! So why not keep that going! Ha! I've got an old rusty Yanmar 3GM freshwater cooled diesel with who knows how many hours on it. It may be reilable...but it may not. All this being said I've looked into the ASMO Thoosa 7000 as my Freedom only displaces about 8,900 Lbs. What I couldn't believe was the PRICE! NGC is selling that system for nearly $8,000????? I'm trying to figure out how it is possible to charge that much for a motor, controller, throttle, and mounting brackets. Stunned is the word. Looks like if I go EP it will be with a DIY setup but I'll have to get educated on this stuff---I don't consider myself a dummy, but this is a field I have never looked into seriously before. Anyway, thanks for the wake-up call guys! Now my wheels are turning! See my link for Cloud in post #2. That will get your feet wet. Come back to this thread you kick started if you have questions.